Spinning lazy circles around her latest conquest, acquisition, or interest, the Piscean woman is a mysterious, sensual mermaid, her secrets kept secure behind inscrutable dark eyes. She has a vivid mind, and is romantic and spiritual. Like the rivers and seas this sign swims in, Piscean women have deep emotions and strong undertows in their personalities, so watch out for still waters - they often hide a passionate, sensitive nature. Spiritual, curious, and gentle, the Pisces woman is a true dreamer. She puts a great deal of emphasis on the unseen in her life, whether it be her own intuition, her emotions, or the world of spirituality and religion. This is a woman who is always looking for - and finding - deeper meaning, from the grand scheme of life itself to her own social interactions. She absorbs the events around her, making connections that other people would never even see. She observes patterns in the feelings and actions of other people, and can be quite insightful as to what motivates them. Pisces is the twelfth and final sign of the zodiac. Ruled by Neptune, the Pisces woman is very intuitive and spiritual. She is sensitive and caring and considers the needs of others. This imaginative and dreamy woman must determine how she will swim through life: with the flow or against it. Pisceans are kind to their friends – and strangers. At any gathering the Pisces woman will either be the shy one in the corner who will listen to people’s problems or the outgoing greeter who warmly welcomes each individual. It all depends on her current mood! A Pisces woman in love expects magic and mystery, like the watery, wonderful world of the deep blue. She loves being in love - to her it is a wistful daydream, a flight of fancy. It is a seduction of her senses, and there is nowhere else she would rather be. When it comes to attraction, Pisces secret weapon is evasiveness. There is an aura of mystery around Pisces, in addition to kindness, femininity, and softness. While you can’t exactly call her aloof, she maintains a subtle distance that keeps others intrigued. When in an emotional jam or argument, a partnered Pisces is likely to use a "who, me?" approach. Some have brought "playing dumb" to an art form, as they have discovered that this is the best way to avoid answering uncomfortable or awkward questions. Like all other aspects of her life, love is an emotional matter for a Piscean woman. She is sensual and playful, prone to creating fanciful settings in the bedroom - enchanted forests, circles of candlelight, the scent of the sea - all these heighten her imagination. She loves feel, and likes to have everything fluid and a little erratic. The more surprises the better. The Piscean woman does not naturally or easily separate physical and emotional love as these two factors indissolubly bound together for her. Pisces is naturally on the submissive side, very willing to please, will try most anything, and generally easily orgasmic. The desire to connect to something more through the act is strong. This is especially true for those with Moon and/or Mars in Pisces. Pisceans are extremely sensitive to the needs of others. In a world of takers, they are givers. These compassionate women are here to help others - it’s their mission - but please don’t take advantage. A Pisces woman is a devoted friend who puts her loved ones’ well being before her own. She is an empathetic individual who is able to present sympathetic viewpoints when asked by friends and family – and they sometimes take advantage of this trait, too much so in many cases. Pisces women will go to great lengths to please their families. A Pisces mother loves her children to the moon and back, but sometimes she may find it hard to discipline them. She is prepared to sacrifice everything so that they can have and achieve their dreams, even at the expense of her own. She always remembers birthdays and anniversaries, so it pays to remember hers because it’s very important to her. She will make a warm home out of the simplest apartment. Ms. Pisces may need to be near a body of water - even if it’s only a small pond. Don’t worry; she’ll imagine it’s an ocean! 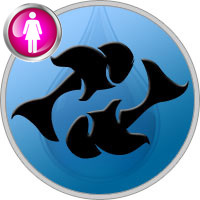 Water does not like constraints, and similarly, Piscean women tend to favor loose, flowing, graceful silhouettes. This little mermaid is most in tune with her world when she is comfortable, wearing clothes that are silky and soft - no binding zippers or corsets for her! A Pisces woman loves shimmer, like light on water, and will adorn herself with jewelry in unexpected places. Anklets, toe rings, and moonstone brooches worn in cascades of hair are her favored fashion accessories.